﻿ Why Price Is 2X? In some limited cases (generally with higher priced stocks), the price we charge is higher than our typical commission (giftize fee) and framing. The Reason: We play by the rules! We MUST meet requirements established by the Securities and Exchange Commission (SEC) and one requirement is that our price cannot be less than 2X the market price of the stock. Normally our commission, framing, and shipping take care of this but may not for companies with high stock prices. Believe it or not, we don't like this requirement because in some cases, customers think we are taking advantage of them. To the contrary, we do this to protect our business and to protect our customers. The image below not only shows the SEC requirements but it also shows what can happen when a company does not play by the rules. The company mentioned used to be a competitor of ours. 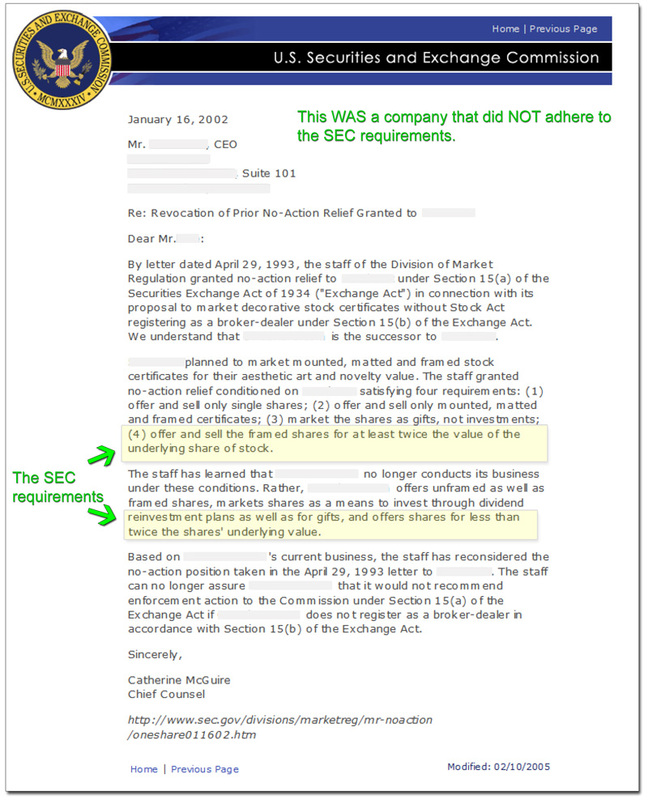 If you want to see the letter on the SEC website.